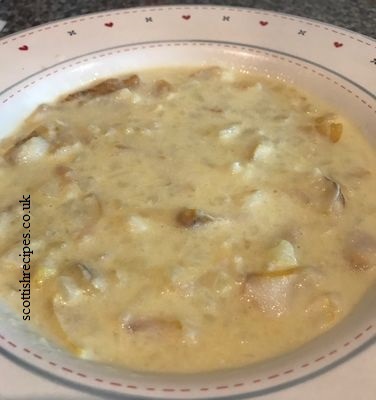 Cullen is a wee town here in the North east of Scotland and a Cullen Skink recipe is traditionally made with Finnan haddock (often called Finnan haddie), potatoes and onions. The word skink means soup or stew. It may also be called Smoked Haddock Chowder in some restaurants. The book Scots Cooking: The Best Traditional and Contemporary Scottish Recipes by Sue Lawrence suggests using Jerusalem artichokes instead of potatoes for a delicious alternative. She also suggests using undyed smoked haddock fillets in Cullen Skink recipes. 1. Skin the smoked haddock and cover with just enough boiled water to cover it. 2. Bring to the boil and then add the chopped onion. 3. Remove the haddock once it's cooked and remove the bones. Remove the head and tail. 4. Break up the fish into a dish and replace the bones into the pot and boil for one hour. 5. Strain the stock and put back to the boil. Boil the milk in a separate pot and then add to the stock along with the fish. 6. Add the salt and boil for several minutes then add the mashed tatties until you get a nice consistency. 7. Add the butter and pepper and serve. The Book Maw Broons Cookbook has a Cullen soup much like our one though it suggest the use of crushed peppercorns for an enhanced flavour. Buy Maw Broon's Cookbook at a discounted price and with free delivery available. Eating in has a Cullen Skink pie recipe. 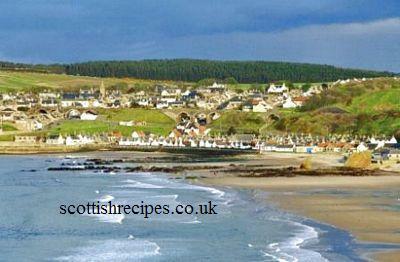 Nick Nairn's New Scottish Cookery has a traditional Cullen Skink soup recipe. Nick Nairn recommends using top quality and undyed smoked haddock for a better flavour. He further advises not freezing it because of the cream content. The Cullen Skink soup recipe used at the cafe in Crathes Castle, Aberdeenshire can be found in the National Trust for Scotland book The Scottish Kitchen by Christopher Trotter. It also has the Crathes Castle Cullen Skink Tart recipe which was created by their chef Alison Mitchell in their wonderful cafe. Scots Cooking: The Best Traditional and Contemporary Scottish Recipes by Sue Lawrence has a Cullen Skink Tart recipe that she adapted after watching Derek the pie man at Alan McPherson's bakery make Cullen Skink pies. Cullen saw the first ever Cullen Skink World Championship in July 2012 on the same weekend as its Summer Festival. Cooks from all over are being urged to enter this inaugural competition. There is only one place in the world that can hold this championship - and that is here. The Tourist Initiative has discussed such a competition many times, but I am absolutely delighted to announce that the championship has now got off the ground, and will be an annual event from now on. There is no reason why this Championship cannot achieve the same scale and prestige as the World Porridge Championship in Carrbridge. The Cullen Skink World Championship title will be awarded to the competitor producing the best traditional Cullen Skink, made from fresh, local produce. It must be made with smoked haddock; each entrant will be asked to submit a recipe and their method of cooking this special dish. From this, the judges will choose 6 finalists to take part in the cook-off. The Cullen Summer Festival this year is going to be even bigger than last year. The Festival is being organised by a number of community groups, and we hope that we are going to dish up a real mixture of events and entertainment which will appeal to all ages. There could therefore be only one date for this championship - and we hope that all eyes will be on here that weekend. The rules of the competition and an entry form will be available on www.discovercullen.com They will also be available from the local Paper Shop, the Tourist Office and the Cullen Bay Hotel. The tastiest place to try the best Cullen Skink soup is Ellen's Fish and Chip Shop in the village of Cullen on the main street. Ellen took the best 10 recipes for Cullen Skink from the local area and devised her own take away version. At only £1.50 it is great value and is lovely and thick with the freshest ingredients and has a lovely creamy taste. Second place goes to Zanres restaurant in Peterhead where you get a huge bowl full and a fresh hot roll for under £5. The portion will satisfy the hungriest of appetites. Cullen Skink tart was a recipe on the Channel 4 television programme Come Dine With Me on Friday 21 November 2008. This edition of Come Dine With Me was from Aberdeen and another of the dinner party hosts cooked Cullen soup and used carnation milk which she said was a Shetland tradition. The Pennan Inn Cullen Skink soup recipe, as given to Scotland's First Minister Alex Salmond can be read in Taste Ye Back: Great Scots and the Food That Made Them. A simpler and plainer Cullen Skink recipe, recommended for people recovering from an illness can also be found in Taste Ye Back: Great Scots and the Food That Made Them. In the 2007 TV programme The Restaurant with top chef Raymond Blanc the contestants were given the task of cooking eels. Scottish contestants Grant and Laura who ran a Scotland French restaurant during the reality television program cooked a Scots Cullen Skink with the eel replacing the haddock ingredient. In September 2007 Downies of Whitehills in Aberdeenshire, Scotland was short listed for their handmade cullen skink soup which is made from local Aberdeenshire ingredients. The Downies luxury cullen skink was nominated for the Local Food Heroes category of the Quality Food Awards 2007. 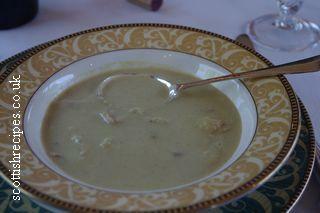 The smoked haddock soup was created by one of the partners of Downies, Mr Alan Downie, own dish.